Konami expand their development by moving PES to smartphone. 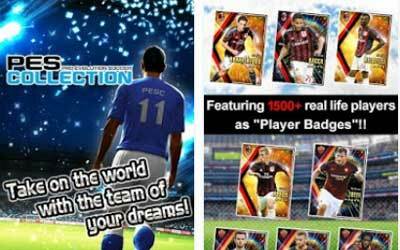 PES COLLECTION APK 1.1.10 is now available for Android. It has been popular especially in Android. This game is an official soccer simulation game licensed by the UEFA Champions league. In this game, users can build their own soccer teams with customizable players. Comes in 3D graphic, PES Collection brings soccer game into new different level. User will get Experience points in matches mode like Challenge Mode, Skill Mode, Special mode and Friendly points in Friendly match mode. Users can improve players ability by collecting badges and points. The good points relies on its highly customizable features. Konami provides real-life players images under FIFPro license. Added with 3D graphics, user will experience a more lively game that is close to reality. PES Collection also lets users to create, mix and match players and upgrade the players’ ability by collecting badges gotten by users as users play many matches. The variants of mode also put the game still as the most favorite soccer-simulation game, with Friendly mode for the less stressing level mode. This game also comes in decent backsound for a more real soccer experience. However, it is not a perfect game. In its first release a lot of users complained about bugs like poor quality of prize drawing and freezing in Badge menu. Furthermore, the game can only be played online using g data internet or WiFi, which is very battery consuming. Because of being able to load in internet mode only, the loading rather comes slow compared to offline games. Still, PES Collection is a decent soccer simulation game with real-life player and real experience of soccer in general.